Fourwalls is like paradise for all flowers and plant lovers. Faux flowers and plants are our forte. We are one of the leading brands in the artificial flowers and plants space in India. We ventured into this field back in the year 2003 and over the years have been able to understand the customer tastes and preferences for artificial flowers and plants in a manner which has enabled us to enhance our selection process to serve our clients timely and effectively. We import premium quality products made of materials such as silk, natural woods, Polyurethane (PU) and a unique blend of fabrics ensuring both durability and quality. We believe in revamping our product mix from time to time ensuring better designs and abstain from monotony. Therefore, we always have some surprises in store for our customers and give them something to look forward to every few months. We maintain exclusivity by getting products custom made from factories conforming to the highest quality standards and greater consumer satisfaction. We also provide floral decoration for banquet halls and are associated with a number of leading 5 Star hotels in Mumbai. We try and stick to our main agenda which is to provide customers with a great experience by offering top quality, long lasting products and at the same time bring them closer to nature by providing real looking flowers and plants which are personally handpicked from multiple cities across borders. We believe in pushing ourselves beyond our limits and are in the lookout for the best quality of floral decor from across the globe to fulfil the growing demand for lifestyle products in our country. Fourwalls is your one stop shop for all your floral Home and Office Decor. 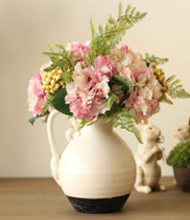 Choose from a massive catalogue of Artificial Flowers, Plants, Trees, Vases and more. Copyright © 2016, Fourwalls. All Rights Reserved. Thanks for contacting us. We will get in touch with you shortly.